Former Jerusalem Mayors Olmert and Lupolianski were indicted for taking bribes to illegally push through the Holyland Park project. A wide-ranging indictment was handed down Thursday morning against 13 defendants in the Holyland Towers case. Among those indicted are former Prime Minister Ehud Olmert and former Jerusalem Mayor Uri Lupolianski. Other suspects in the case include some veterans of Israel's political and business scene, including Danny Dankner of Bank Hapoalim; Ya'akov Efrati, former director of the Israel Lands Administration; Avigdor Kellner, who established and headed the Holyland Park company; Shula Zaken, head of Olmert's office; and others. 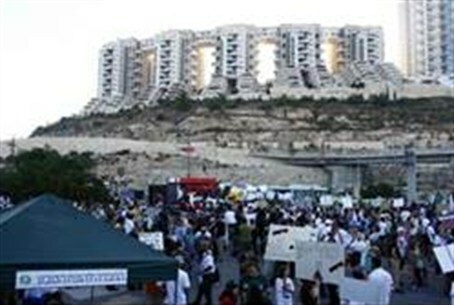 Many of those indicted worked for or with Olmert when he was mayor of Jerusalem, the period during which the Holyland Park project received permits, and was developed. The charges claim that the large Holyland Park apartment project, whose towers are visible from all parts of the city, were developed and built as the result of bribery and other corrupt means. The project – which is only halfway finished – was the result of four different approval processes that were rammed through the various planning and building committees, in violation of many of the city's construction and architectural laws. Prosecutors stressed that the corruption was not an isolated phenomenon in Jerusalem, but a method of doing business, with contractors, landowners, and other high-rolling businesspeople paying their way to approval of projects and permits by bribing officials, including Olmert himself. Among the specific violations, the indictment said, were the significant shortening or even elimination of permit requirements, quashing opposition by citizens' groups, illegally increasing the size, breadth, and purpose of building projects, changes in zoning laws to suit the plans of landowners and contractors, looking aside at construction and pollution violations, and reduction of taxes and fees in exchange for favors. While the main portion of the indictment surrounds the construction of the Holyland Park project, it also discusses other incidents of corruption, including land approvals in Eilat, Atlit, Havat Shalem, and other areas. Amir Dan, a spokesperson for Olmert, called the indictment “shocking. Issuing an indictment now, when Olmert is already on trial for other issues, is shocking by itself, and appears to be an attempt to influence the court against Olmert in the current trial. Olmert has declared numerous times that he never took a bribe, directly or indirectly, and this indictment will not change that fact,” adding that the indictment was issued without allowing Olmert a hearing first.